service from January 1 to October 31, 2018. Personnel who remains to be in the government service as of October 31, 2018.
given not earlier than November 15, 2018. 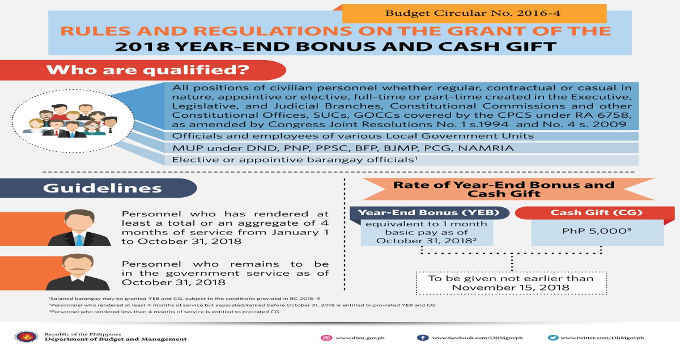 Cash Gift – Php 5,000. to be given not earlier than November 15, 2018.
year-end bonus and cash gift, within the month of retirement or separation. PhP 6.5 Billion for the year-end bonus of military and uniformed personnel (MUP). Meanwhile, PhP 5.6 Billion and PhP 1.7 Billion have been allocated for the 5,000 peso cash gift of civilian personnel and MUPs, respectively.